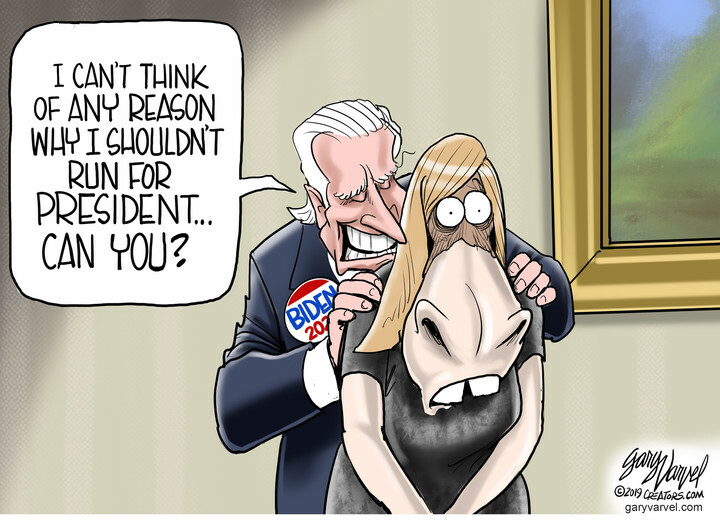 This Morning, On Day #809 Of The Trumpster’s First Term, While Everybody Hereabouts Is Wondering If Joe Biden Is Still The Leading 2020 D-RAT Presidential Candidate, Our Conservative Cartoonists Carry On With Their Caustic Commentary. That’s because Mid-Term Elections were a National Election, a referendum on everything Trump has accomplished, and Congress, the Deep State, the Radical Media Establishment will continue to lie and say really stupid things without a smidgen of journalistic integrity in their effort to advance their Radical Leftist Agenda. Beloved Whistleblower Publisher Charles Foster Kane Says The Conservative Agenda Is Now Working On Donald Trump’s Eighth 100 Days To Make America Great Again. Today Was Day Number 809 And There Are Now Only 573 More Days Until Trump’s Re-Election Day on November 3, 2020. This entry was posted in Uncategorized and tagged "Senior Political Commentator", Beto, Border Wall, Conservative Cartoonery, FAKE NEWS CNN, Influential Conservative, Leftist Orchestrated Hate Crime Hoax, MICHAEL COHEN, Mueller Report, Mueller Witch Hunt, No Collusion, NO COLLUSSION, Ohio’s Delusional Republican Ex-Governor John Kasich, State of The Swamp Speech, Trump on April 9, 2019 by charlesfosterkane.